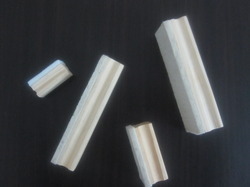 The vishnu pyroceramics is one of the reliable manufacturers and suppliers of chalk dusters, which are designed with precision by the experts. These chalk dusters are made using premium quality raw materials that assure their reliability and durability. Our company has created niche in the field of offering School Duster. We are a unique entity in this industry, actively engaged in offering a premium quality array of Chalk Duster. Blackboard Duster is highly demanded among our client owing to its dimension and termite-proof body. We are one of the reliable manufacturers and suppliers of Chalk Dusters, which are designed with precision by the experts. These chalk dusters are made using premium quality raw materials that assure their reliability and durability. Keeping track of contemporary market development, we are devotedly occupied in providing an extensive series of Chalk Wood Frame Duster. We are engaged in offering a versatile range of Blackboard Dusters. Our range of dusters includes magnetic board dusters, white board dusters (magnetic), white board dusters (wooden) and black board dusters. These are able to rub off chalk on any kind of board and the chalk dust can be removed with ease.